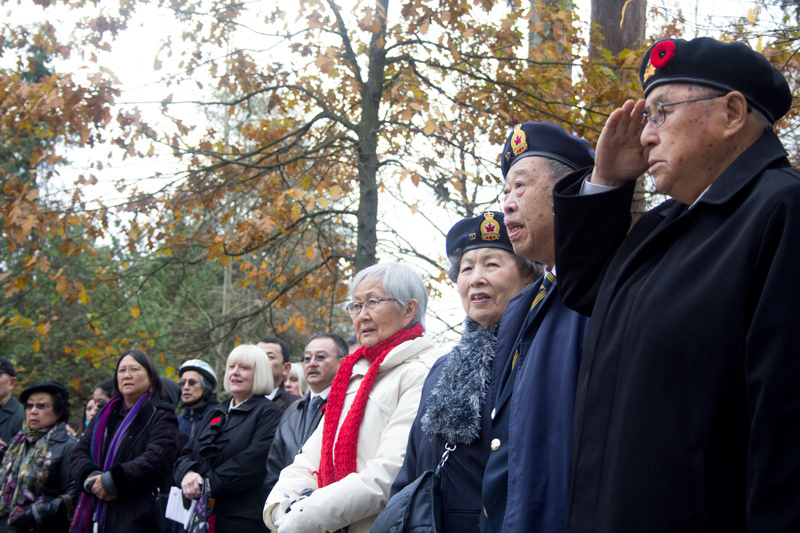 Last year, on Remembrance Day, instead of heading to Victory Square, I went to the quieter, but equally heartfelt ceremony at the Japanese Canadian War Memorial in Stanley Park. There, I met the remarkable Minoru Yatabe, who had journeyed all the way from his home in Toronto, at the age of 90, to lay a wreath on behalf of Canada’s dwindling number of Nisei veterans. Yes, you heard that right. There were Japanese Canadians who enlisted during World War Two, even after they and their families were branded “enemy aliens”, stripped of their property and possessions, forced into labour camps or interned, and of course, still denied all the rights of citizenship. Mr. Yatabe was one of those who signed up. Although the Vancouver-born youth managed to escape the worst of internment by working on a farm in Ontario, his dream of graduating from UBC with an engineering degree was dashed, and the hardships and injustice suffered by Japanese Canadian internees were no secret. Even then, Canada refused to allow Japanese Canadians into the armed forces. Only prolonged pressure from British authorities, who wanted to use them for intelligence work in Asia, finally lowered the country’s racist military barriers in early 1945. Minoru Yatabe signed up on Jan. 17. The dropping of atomic bombs on Hiroshima and Nagasaki ended the conflict against Japan before Mr. Yatabe saw action. But he and a few other Canadian Nisei were nevertheless involved in a fascinating but little-known chapter of the war’s aftermath. Because of their language skills, British officers charged them with “clearing” huge numbers of Japanese troops in northern Thailand, before they were shipped back to Japan. While that was going on, another Japanese company suddenly arrived. He was ordered to process them all by himself. “You have your sidearm and a Sten gun. Take the jeep and off you go,” instructed his commanding officer. Mr. Yatabe still relishes the memory of what happened next. Such a delicious and satisfying sight. A high-ranking, Japanese officer surrendering his troops to one young Japanese Canadian from Kitsilano. 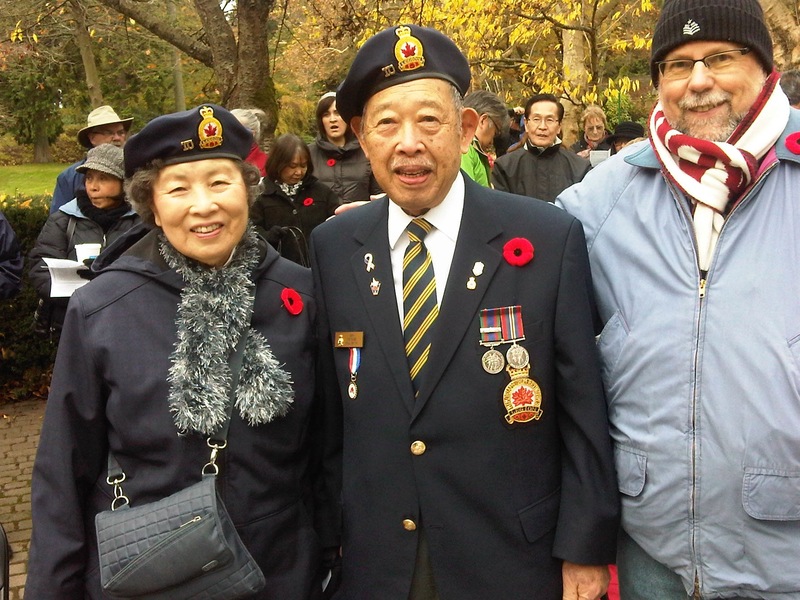 Minoru Yatabe, with wife Lydia and myself, after laying a wreath at the Japanese Canadian War Memorial in Stanley Park last year. Here is my first story for the thriving online “publication”, The Tyee. Not only that, it’s a labour story. Be still my beating heart. 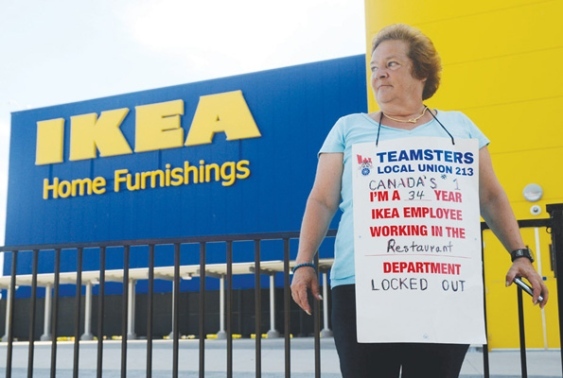 We shall see if these international bodies do come through for the beleaguered IKEA workers in Richmond, but it’s certainly a potentially significant development for a dispute that, right now, shows no sign of ending. Breaking, as they say: Gary Mason now reporting that B.C. and Alberta have signed a pipeline pact. What the…? Hehe….Good old politics. Christy Clark will sign on to a national energy strategy, promoted by the other provinces, and Alberta has agreed to Clark’s Famous Five conditions. AND IT’S A DEAL!!! Well, sort of…Perception is everything in politics…Click to read. Actually, it ain’t much. I was always mystified by what B.C. and Alberta could be negotiating, since Alberta wasn’t going to give any dough to B.C. Alberta, correctly in my view, maintained that this was a matter for B.C. to take up with Ottawa and the pipeline people. Alberta has agreed to nothing on condition five, and first four conditions remain up to B.C. A totally uncecessary “agreement”. But perhaps, bosom buddies, again…..
First, they were the best of friends. Then, they weren’t. Then, they were the best of friends, again. Now, suddenly, once again, they’re not. Follow the bouncing ball, folks, as those good old neighbouring premiers, our own Christy Clark and Alberta’s Alison Redford enact their own version of climate change. From warm and sunny, to frosty, to….well, you get the picture. The latest icy blast seems to have happened all in an instant. According to Globe and Mail columnist Gary Mason, Redford landed in Vancouver on Monday, ahead of her Tuesday speech to the city’s Board of Trade, fully expecting to meet at some point during the day with Christy Clark. In fact, she said she was looking forward to their long-planned meeting. All at once, she learned the meeting was off. Yikes! The premiers’ latest falling out, of course, is over that that darned Northern Gateway pipeline proposal. Mason, who broke the story, said their get-together is now kaput, apparently because of B.C.’s continued demand for some sort of compensation from Alberta for allowing the pipeline to cross the hallowed turf of beautiful British Columbia. But oh, the timing. As recently as Saturday, on CBC’s The House, Redford talked warmly of Premier Clark, praising her leadership on energy matters. She reminded host Evan Solomon of their private pipeline palaver on Tuesday, and yes, she was looking forward to meeting her again, after their friendly discussion this summer. So what the heck happened to kibosh this pending love-in? 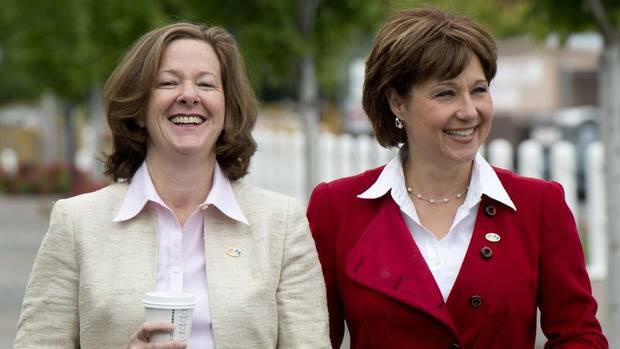 Why the spat now, with Alison Redford right here, in the heart of Vancouver? What is this, As the World Turns? But even for a soap, the timing of the rupture doesn’t make sense. Anyway, read Gary Mason’s fine piece on the Globe’s website, then take a gander below at what Alison Redford said just a few days ago about her warm and fuzzy feelings toward Christy Clark. Astonishing. Real scratch-your-head stuff. REDFORD: I’ve never regarded our relationship as being frosty. I mean, we’re both premiers. 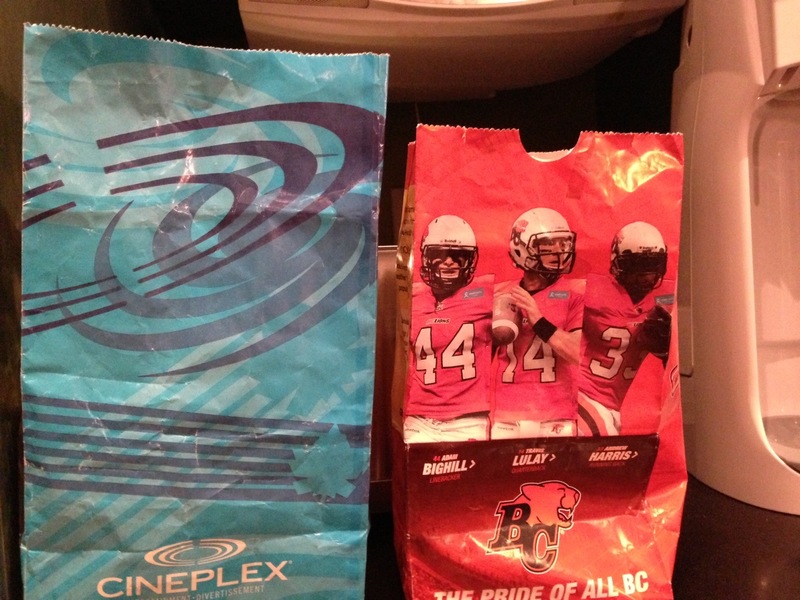 We both represent our province’s interests. I like to think I do that well, and she’s certainly done that well. But in terms of personal relationships, we’ve gotten along very well, and this will be my third or fourth meeting with her in the last year on this issue. We’ve had really good dialogue. You may know that we have a partnership with our deputy ministers to deal with some of the issues around Gateway. This [meeting] will be a continuation of that work, to really update, and make sure that we’re still on the same track. Premier Clark has really been important in the Canadian dialogue and what it means in terms of a Canadian energy strategy to get product to market. And she’s taken a really firm view on that in the last three or four months, talking about the fact that she understands the people in British Columbia do have a role in ensuring that we get product to market, cuz that’s good for Canada. So that’s the spirit of what we’re talking about right now, and I’m looking forward to seeing her. EVAN SOLOMON: But given all the opposition, is this pipeline really possible? REDFORD: It’s not too far in the future. It’s something we do need now to get our product to market, so that we can get the best possible price. The other thing is, it’s a bit of a misnomer, and some people in British Columbia, in government, understand this. The Premier certainly does. You actually have to connect LNG projects to oil sands projects, because very often the companies involved in investing in LNG have major investments in oil sands, and it’s all part of their corporate approach to how they invest in Canada. …There’s lots of work to do, but I think it can happen. Now, the two aren’t talking. Winter appears to have come early….Brrrrr…. I was missing from Vancouver during those pelvis-percolating daze when the Russian Rocket soared into the city’s hockey pantheon. The manner of his arrival likened by one scribe to “an Aeroflot ghost flight from Irkutsk”, Pavel Vladimorovich Bure was by far the most exciting player to don the blades of the mighty Canucks in the team’s up and down, 43-year history. He remains its only member of the Hockey Hall of Fame. 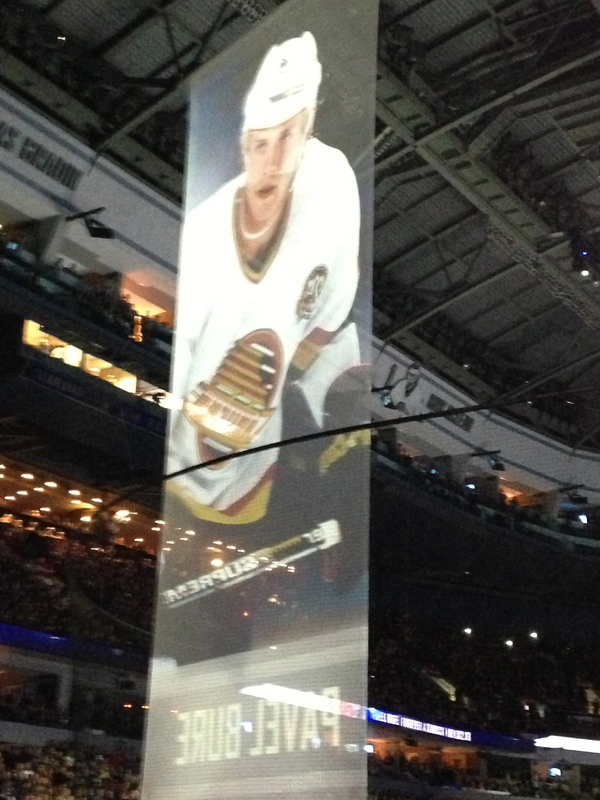 But I do remember watching from afar, on my cheap TV set, the first time Bure carried the puck in the NHL. I gasped out loud. It was if there were rocket boosters on his skates, firing at warp speed. The other players seemed to be standing still. Nike’s Swoosh had come to life. 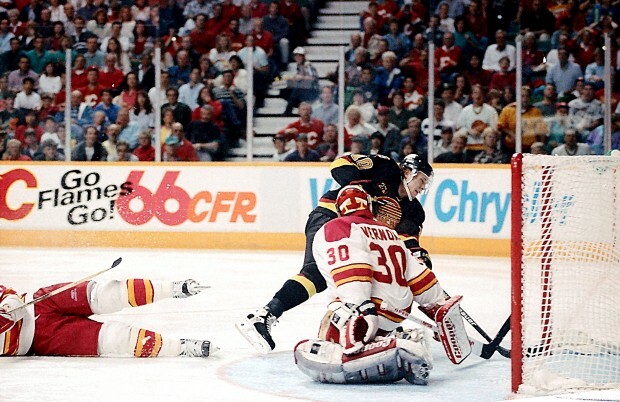 Sixty-goal seasons followed, topped by the 7th game, never-to-be-forgotten, breakaway goal in second overtime that eliminated the favoured Calgary Flames in the first round of the Canucks’ 1994 run to the Stanley Cup final. Over time, however, for all sorts of reasons, the love affair between the city and its spectacular speedster slowly soured. Beset by injuries, Bure appeared to tire of the adulation and the pressure. Local sportswriters despaired of ever getting a decent quote from the stand-offish superstar. During my one brief encounter with Pavel Bure, I saw a different side of the astonishing Russian. It was the fall of 1997. Improbably, the NHL opened its season that year with two games in Tokyo, between the Canucks and the Anaheim Ducks. As the Globe’s Asian correspondent, I got the plum assignment. The Canucks came to me! One morning, to give the Canuckleheads a dose of life in teeming Tokyo, the players rode to the rink on a packed commuter train. Most were no fans of the cramped quarters, swaying to and fro, cheek to jowl with other strap-hanging passengers. “It’s the team bus from here on in, guys,” groused Mark Messier. After practice, I saw him in his gangster-like, pinstripe suit, hanging out beside the team bus with unlikely best buddy and team enforcer Gino Odjick, whose own cheer from the pumped crowd Saturday night almost matched the roar for the Russian Rocket. With his distinctive red lips and boyish good looks, he looked barely 21. His face was bursting with boredom. Four months later, at Nagano, Bure scored five goals for Russia in the team’s semi-final match against the Finns, one of the best individual performances in Olympic hockey history. Three came on breakaways. Once he deked left. Once he shot. The third time, he deked right. Love him or loathe him, we will never see his like again.